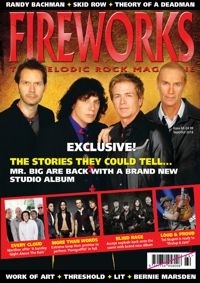 FIREWORKS #65 arrives a little earlier than expected with an exclusive cover story on the new Mr Big album and a few stories they could tell us. Elsewhere Accept tell us about their wonderfully melodic new album 'Blind Rage’, Extreme chat to us on their recent UK tour performing Pornograffitti in full, Ted Nugent tells it like only Ted can, Work of Art put us in the frame with their new album … and so much more, with Skid Row, Threshold, Thoery of a Deadman, Bernie Marsden, Hammerfall, Mike Tramp, Unisonic, AOR, Kix, Paul Gilbert, Helix and many up and coming new bands in the scene. Also our usual in-depth CD reviews across 14 pages and a live section that this issue covers Sweden Rock and Download up close and personal.